The Global Volcanism Program has no activity reports for Billy Mitchell. The Global Volcanism Program has no Weekly Reports available for Billy Mitchell. The Global Volcanism Program has no Bulletin Reports available for Billy Mitchell. Billy Mitchell, a small pyroclastic shield immediately NE of Bagana volcano, has produced some of the largest Holocene eruptions in Papua New Guinea. The andesitic-to-dacitic volcano is truncated by a 2-km-wide caldera containing a shallow lake with a small island near its S shore. Two major explosive eruptions, one about 900 years ago and the other about 370 years ago, produced dacitic pyroclastic-fall deposits that cover most of the northern half of Bougainville Island. The younger eruption may have been responsible for formation of the nearly vertical, steep-walled summit caldera. Pyroclastic-flow and -surge deposits extend 25 km to the E coast of Bougainville Island. Johnson R W, 1992. (pers. comm.). McKee C O, Patia H, Johnson R W, 1988. Contrasting eruptive styles at the adjacent volcanoes Bagana and Billy Mitchell on Bouganville Island, Papua New Guinea. Proc Kagoshima Internatl Conf Volc, p 131-134. There is no Deformation History data available for Billy Mitchell. There is no Emissions History data available for Billy Mitchell. 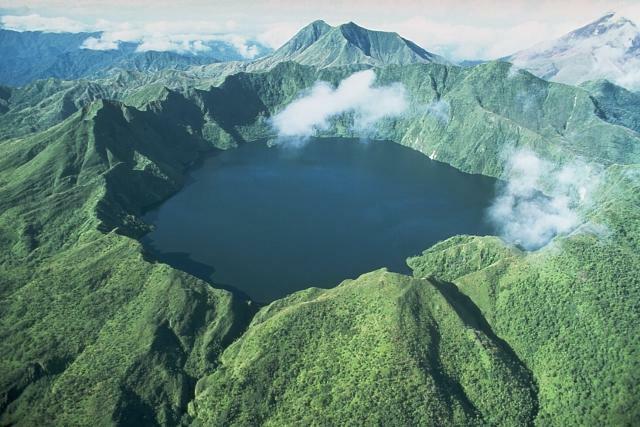 The beautiful caldera lake of Billy Mitchell provides a dramatic setting for unvegetated Bagana volcano, one of the most active in Papua New Guinea. The Solomon Sea can be seen in the distance to the SW. Two major explosive eruptions from Billy Mitchell, one about 900 and the other about 370 years ago, produced pyroclastic-fall deposits that cover most of the northern half of Bougainville Island and pyroclastic-flow and -surge deposits that extend 25 km to the eastern coast. The younger eruption may have been responsible for formation of the summit caldera. 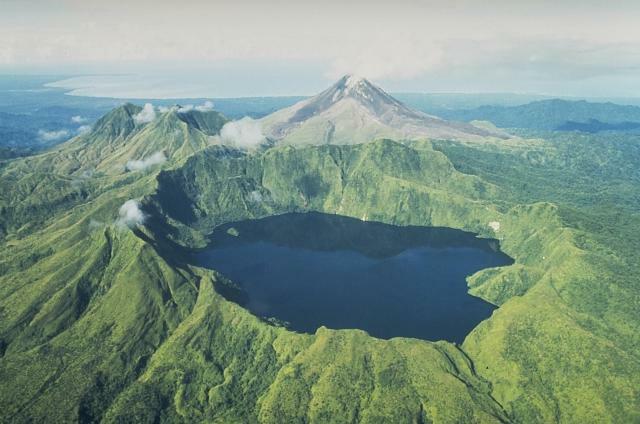 Billy Mitchell is a small pyroclastic shield truncated by a small 2-km-wide caldera containing a beautiful caldera lake. 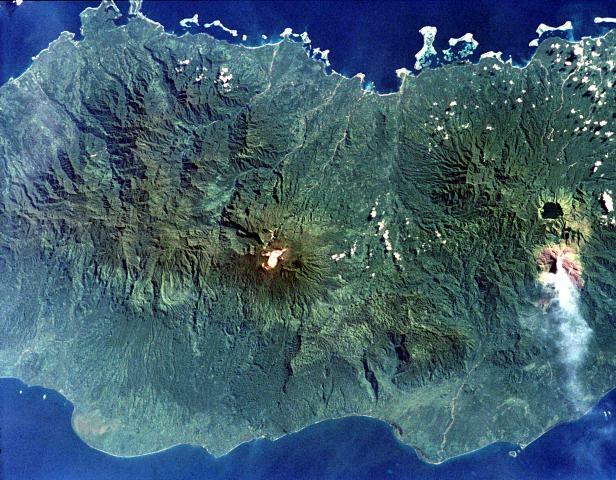 It is seen here from the north, with the eroded forested Reini volcano on the center horizon and neighboring Bagana volcano at the upper right. Billy Mitchell has been the source of some of the largest Holocene eruptions of Papua New Guinea. Two major explosive eruptions, one about 900 years ago and the other about 370 years ago, produced pyroclastic-fall deposits that cover most of the northern half of Bougainville Island. Photo by Wally Johnson, 1989 (Australia Bureau of Mineral Resources). There are no samples for Billy Mitchell in the Smithsonian's NMNH Department of Mineral Sciences Rock and Ore collection. Large Eruptions of Billy Mitchell Information about large Quaternary eruptions (VEI >= 4) is cataloged in the Large Magnitude Explosive Volcanic Eruptions (LaMEVE) database of the Volcano Global Risk Identification and Analysis Project (VOGRIPA).